The increased speculation surrounding Sean Dyche’s future in football is just the nature of the beast according to Clarets defender Ben Mee. 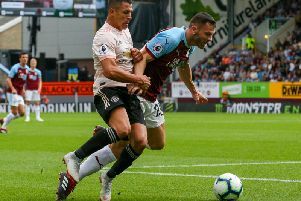 The 28-year-old centre back, who has been at the club from the beginning of the Burnley boss’s tenure, accepts that the interest is a product of Dyche’s success and growing reputation in the sport. The Turf Moor chief’s odds to become Craig Shakespeare’s successor at the King Power Stadium have dropped slightly with bookmakers as Manuel Pellegrini, Chris Coleman and Claude Puel are also in the running. However, Dyche remains one of the favourites for the vacancy as the Foxes continue to gravitate towards him. With Dyche’s fifth anniversary on the horizon, Mee said: “He’s been fantastic. There’s talk but he’s focused on us at the minute, long may that continue and we look forward to having him here. “It’s been four or five times now he’s been linked. He’s doing such a good job here that he’s bound to get some attention. Mee added: “Long may that continue. We’re going to keep growing as a club. From when we’ve been to where we are now has been a massive shift. “I’ve been here since he arrived, the changes at the club and how far its come is massive. It’s been brilliant and I’ve enjoyed it. The former Manchester City man believed the Clarets gave a good account of themselves for the majority of the game at the Etihad Stadium but were eventually unlocked by world class opposition. Sergio Aguero’s spot kick opened the scoring after Roger East’s dubious decision to punish the coming together of Nick Pope and Bernardo Silva. Nicolas Otamendi doubled the advantage with a header from Leroy Sane’s corner in the second half before the German international completed the scoring in the 75th minute. “They’re a top side and it’s a tough place to come,” he said. “They make the pitch really big, they move the ball really well and they press really well when we have it, we were struggling to get out and use the ball. “That’s something they’ve changed this season, we really struggled to keep hold of the ball. We would have liked to use it better and create more but they closed us down and worked hard. “We were in the game for 70 minutes and the second goal has killed us. We’re disappointed it was from a set play, we’re usually solid from them.